A sculpture erected in Dublin to mark the armistice has been vandalised. Red paint was thrown over the Haunting Soldier in St Stephen’s Green overnight on Wednesday. The six-metre high artwork portrays a weary soldier returning from war. Designed by Dorset-based artist and blacksmith Martin Galbavy, it is made from scraps of metal including horse shoes, spanners, car jacks and brake discs. The sculpture was due to stand in the popular city centre park until November 26. 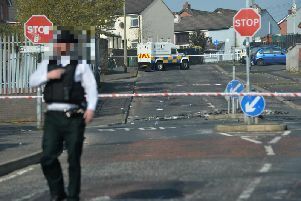 Irish Culture Minister Josepha Madigan voiced disappointment about the attack. “This installation honours all those who died in the terrible suffering of World War One,” she said. Workers from the Office of Public Works (OPW) were tasked on Thursday with cleaning up the sculpture. The Haunting Soldier is designed to evoke the fragility and suffering of those who survived the war and returned home to an uncertain and difficult future. The ghostly figure, which was constructed by Chris Hannam of Dorset Forge and Fabrication, was brought to Ireland by Dublin-based solicitor Sabina Purcell, who discovered she had a family connection to those who served in the war. Remembrance wreaths and flowers laid at the base of the sculpture were also damaged in the attack. One of the wreaths splattered with paint was laid by the New Zealand All Blacks ahead of their rugby match with Ireland last Saturday. It was a tribute to the first captain of the All Blacks Dave Gallaher. Donegal-born Gallaher was killed in action at Ypres in 1917. The laurel wreath had been laid last week by players Sam Whitelock, Liam Squire and Nepo Laulala. Sabina Purcell, who was behind efforts to bring the sculpture to Ireland, branded those responsible an “embarrassment” to Ireland. “I’m very upset,” she told the Press Association. “This does not reflect who we are or what we have become and whoever did this is an embarrassment to us. “This was given to us on loan as a gift and they just simply didn’t seem to appreciate that or even care. “If I had my time to do it again, I would do it all over again. I’m not going to be dictated to by these people who did this.